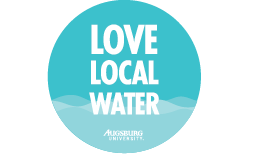 Augsburg is launching a #LoveLocalWater initiative, joining other colleges and universities who are committed to reducing or eliminating bottled water through efforts like Take Back the Tap and Ban the Bottle. The Environmental Stewardship Committee looks forward to working with students, staff, and faculty to determine how to best implement this policy across campus over the coming years. We recognize that both infrastructural and cultural changes are crucial for this policy to be successful in making local water widely available around campus. Water fountains are being systematically replaced and installed as needed, and students are working on education, behavior change, and signage. Stay tuned for more information on what’s happening! To get involved or share your ideas, email us at environmentalstewardship@augsburg.edu. In the meantime, learn more about the water coming through our pipes and see how the City of Minneapolis is promoting tap water across town! Need a reusable water bottle? Pick one up for free at the Campus Cupboard! Thanks for Environmental Action Committee for sponsoring the Water Bottle Share program. 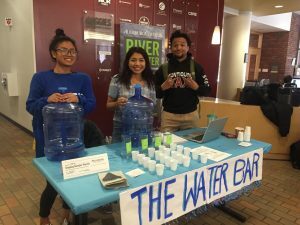 The Environmental Action Committee (Student Government) may be able to help with purchasing supplies that will directly benefit students as we move away from bottled water. Apply for a grant!